14 1/4″ high x 8 1/2″ wide. Extends 7 3/4″ from the wall. Backplate is 4 1/2″ wide x 1″ deep x 6″ high. Weighs 3.45 lbs. Takes one maximum 60 watt medium base type A bulb (not included). Wilson outdoor wall light by John Timberland®. Textured black finish steel; water glass. Shade is 6″ wide x 8 1/2″ high. 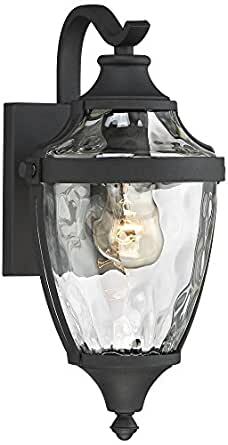 By John Timberland®, this outdoor wall light is a charming addition flanking a front door or illuminating a patio. The light features a classic lantern silhouette, made exceptionally more inspiring with gorgeous water glass that creates depth and visual interest. A textured black finish decorates steel construction, making this a versatile style choice for any home. – 14 1/4″ high x 8 1/2″ wide. Extends 7 3/4″ from the wall. Backplate is 4 1/2″ wide x 1″ deep x 6″ high. Weighs 3.45 lbs. – Takes one maximum 60 watt medium base type A bulb (not included). – Wilson outdoor wall light by John Timberland®. – Textured black finish steel; water glass. – Shade is 6″ wide x 8 1/2″ high.